Bill Dickey. Yogi Berra. Elston Howard. Thurman Munson. Jorge Posada. From this list, you can tell that the Yankees have a pretty rich catching history. Unfortunately, we’re not here to talk about any of those guys. We’re here to talk about one of the less revered backstops in the franchise’s storied encyclopedia. Let’s take a wincing glance back at the Matt Nokes era! Unlike most of the greats listed above, Nokes was not a Yankees home grown product. In fact, the San Diego native was drafted by the Giants in the 20th round of the 1981 draft out of Patrick Henry High School. He used his powerful left-handed swing to work his way up the minor league ladder, and made his debut as a September call up in 1985. The 21-year old went 2-4 in his first big league game, and played in 19 games the rest of the way. That offseason, the Giants flipped him, and pitchers Eric King and Dave LaPoint to the Tigers for Juan Berenguer, Bob Melvin and Scott Medvin. The Tigers had the great Lance Parrish on the roster, so Nokes spent most of 1986 in AAA. When Parrish left as a free agent that offseason, the Tigers didn’t mind, because they had Nokes ready… Boy did that patience pay off for everyone. Nokes was handed the starting job prior to the 1987 season, and he had one of the better hitting seasons by a catcher in team history. Counting his time behind the plate and as a DH, Nokes hit .289/.345/.536 with 32 home runs and 87 RBI. While Nokes’ numbers weren’t good enough to win the American League Rookie of the Year because a couple of guys named Mark McGwire and Kevin Seitzer finished ahead of him, he set the since-broken home run record for rookie catchers (28 of his 32 round-trippers), helped fans forget about Parrish and had a large hand in the team’s run to the ALCS that year. Nokes’ numbers and playing time dipped considerably over the next few years. He saw his home run totals fall to 16 in 1988 and 9 in 1989. Look, something wacky went on with the baseballs in 1987 and everyone hit a ton of home runs (Wade Boggs hit 24, people), but Nokes’ 32 bombs is still impressive. In the end, platoon splits and league adjustments are probably what did Nokes’ Tigers tenure in. By the summer of 1990, the Tigers had had enough of Nokes, and they agreed to ship him to the Yankees for reliever Lance McCullers and prospect pitcher Clay Parker. Although Nokes was supposed to supplant defensive specialist Bob Geren and join Rick Cerone in the Yankees catching rotation, the Yankees ended up playing him at DH a lot (even a couple of ill-advised appearances in the outfield), and kept their three-headed catching monster alive throughout the rest of the season (I know… what a devastating trio!). 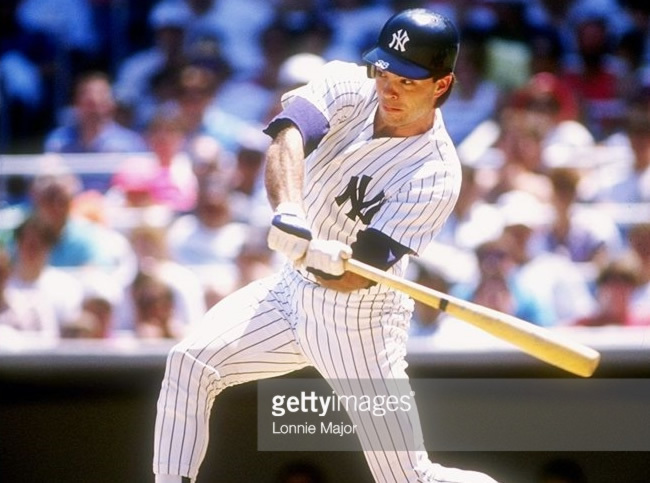 Nokes was acquired to help the Yankees struggling offense against right-handed pitching, but he hit just .238/.307/.354 with 8 home runs and 32 RBI in 92 overall games and 264 plate appearances that season. When Cerone left for Queens in 1991, the Yankees made Nokes the every-day catcher ahead of Geren, and the big lefty responded by having his best season in pinstripes. In 135 overall games (112 starts behind the dish), Nokesy hit .268/.308/.469 with 24 home runs and 77 RBI in 493 plate appearances. The next year, Nokes upheld his home run total by mashing 22 bombs, but his .224/.293/.424 slash line was fairly putrid. That, combined with the fact that the Yankees had brought in Mike Stanley as Nokes’ backup that season and it turned out that the former Ranger was pretty good with the bat, pretty much doomed Nokes’ time as an every-day player for the Bronx Bombers. By 1993, Stanley was mashing homers as the starting catcher, and Nokes was riding the bench and backing up full time. He did have one magic moment that season, however–one that Stanley can never take away from him. On September 4, 1993, with yours truly in attendance and sitting behind home plate, Nokes caught Jim Abbott‘s no-hitter. It was the 8th no-hitter in Yankees history, and, because of Abbott’s incredible story of overcoming a disability (the lefty was born without a fully-formed right hand), easily one of the most memorable. Eat that, everyone! 1994 was a pretty disastrous year for Nokes. Although he was slotted as the backup to Stanley coming out of spring training and got out to a hot start, he broke a bone in his hand in late April and spent the next couple of months on the shelf. He ended up hitting .291/.329/.595 with 7 homers and 19 RBI in 28 games, but his Yankees career came to an end after the season, as he was granted free agency by the club. Nokes tried to stay around baseball, spending some time with the Orioles and Rockies in 1995, but never made it back to the big leagues. After kicking around Mexico and the independent leagues into his late 30s, Nokes retired, moved home and opened up a school for hitters. Nokes had the unfortunate displeasure of being a key player on some pretty rancid Yankees teams, and that’s why many are quick to forget him, but we definitely forget that he was there for the beginning of the franchise turnaround in the mid-1990s. He was mostly a part of the old guard making room for a dynasty, but he was there! I mostly remember him for the way he stood at the plate (crouched and almost hunched over, bat straight up in the air), and his looping lefty swing that sometimes saw him drop to a knee and still hit balls over the right field porch at the stadium. For real, 10-year old me had his stance and swing down pact in my front yard scrimmages. There’s also the video below… I’m pretty sure Roger Clemens remembered him for a while after this one. Enjoy it. We love you Nokesy!